In Between the Covers: Verabear's Book Case: Thursday Thirteen #14 - Books! Thursday Thirteen #14 - Books! For this edition of my Thursday Thirteen, I list the books on my current to-read pile. There are plenty of other books in the house that I haven't read and would love to read too. It just so happens that I bought the ones on this pile myself - mostly second-hand. New Moon - Book 2 of the Twilight Saga by Stephenie Meyer. I just finished reading Twilight for the second time and I'll probably start this one in a day or two. I gotta post about the recent two books I finished reading before I start another though. Eclipse - Book 3 of the Twilight Saga. Okay, it's obvious that I already own all four books in the series. I figured I'd buy them at once while Fully Booked at Gateway still had paperback stocks. I actually had to reserve these via email. The first three books were picked up for me by my friend Vanette, while Breaking Dawn in paperback was restocked only last weekend. The CS peeps over at Fully Booked were kind enough to inform me that it was already available so I picked it up on Monday. Breaking Dawn - Book 4. Alfred is interested in reading the saga and I am encouraging him because it is rare that he shows interests in books. I'm not sure how he'd react to the cheesy stuff though. My Friend Leonard - James Frey. I had read A Million Little Pieces and was moved, sometimes disturbed, by the story. I don't care if he embellished and if it wasn't 100% truthful, he had very powerful words and he painted pictures that people should see. I am looking forward to this one, and I am assuming it will revolve around the same Leonard that was part of the first book. While I was at the bookstore, I found out about a third novel that Frey wrote. If I still like this one, I'd most probably be getting that too. Lirael - by Garth Nix. Book 2 of the Abhorsen series. It's been years since I read the first of the trilogy: Sabriel. It's a Young Adult Fantasy and I love it! The main character in the first book is a young girl. Lirael will continue on with what had happened after the events in the first book took place. I'm hoping I can dig out the first book so I could jog my memory a bit before I start on Lirael. Homer's The Iliad and The Odyssey . You gotta take one when you take the other right? Haha. I wonder if I'll understand much of what is written in these two books? Anna Karenin by Leo Tolstoy. PS I Love You by Cecilia Ahern - Loved the movie, I'm sure I will love the book even more. The Nanny Diaries by Emma Mclaughlin, Nicola Kraus. Here's another title whose movie adaptation I enjoyed watching. The Year of Pleasures by Elizabeth Berg - I had read two or three of her novels before and I truly enjoyed them. So full of heart. I've already forgotten what this one is about, but I'm sure I will like it. The Devil Wears Prada by Lauren Weisberger - Can you believe that I didn't see the movie? I'll read this, and then watch. Checkout my previous TT’s here and here. Also don’t forget to sign Mr Linky, and leave a comment so I can go visit you too. Les Miserables, The iliad, and the Odyssey are three excellent books. Happy reading. 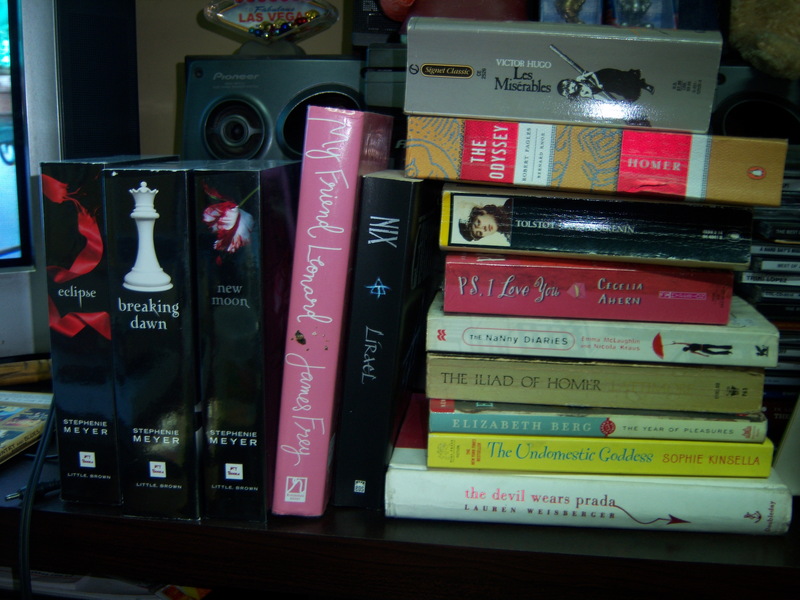 All three of my teen daughters loved the Twilight series :) Happy TT and thanks for stopping by! THe Twilight series was really good! Don't be intimidated by the size of Les Miserables, it is excellent as is Anna Karenina. Enjoy your reading and have a happy TT! These sound like some great reads. Looks like you have a lot of reading ahead of you. Enjoy! Happy TT. These sound like some interesting books. Good list too! That's a hefty list. Enjoy the Tolstoy! Thanks for cheering me on, hehe :) I will tackle both in good time. Yeah, I wonder where I'll find more time to fit them all in? Thanks for dropping in! you have some exciting titles here. happy reading. I'm so with you on the joy of book stores. I feel as much enthusiasm about libraries! thanx for visiting my tt about the novel Matrimony. be sure and come back to enter the drawing for a copy next week. Take my advice. Makes sure you have a copy of Abhorsen handy for when you finish Lirael. I just saw Stephenie Meyer on Ellen Show. She's the best author! I hope I get to see a rerun of the episode. What is your impression of her from the interview? I too have a lot of books on my shelf that I plan on reading one of these years. I read Les Miserables in my World Lit class back in high school and thought it was a really good story.